My new friends from Michigan, Fred and Doris, came out this weekend to go on their first meteorite hunt. Well, technically Fred came out to go on his first meteorite hunt, and his wife was nice enough to come along, too. 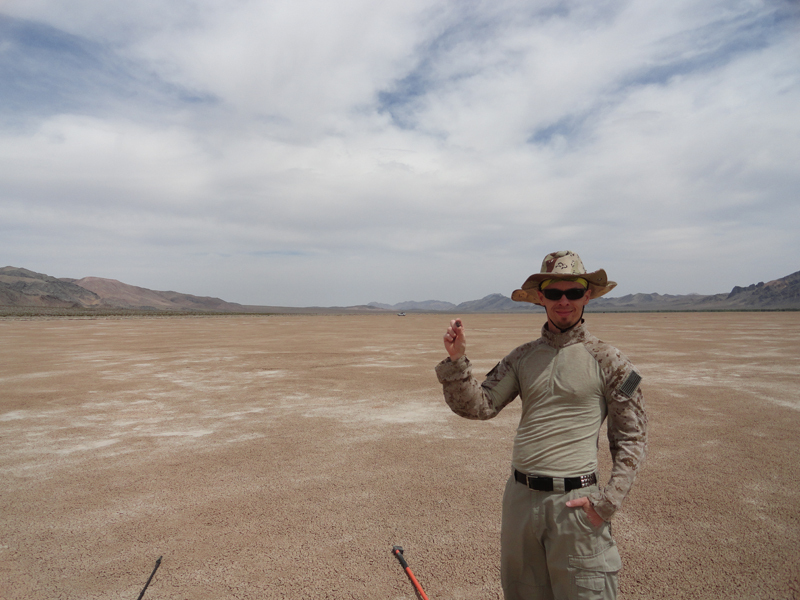 I selected two spots to take them to show a couple different terrains and hunting methods, one featuring desert pavement and the other a dry lake playa. After a few margaritas and some Mexican food Friday night in honor of Cinco de Mayo the coming Sunday, we headed out into the Mojave first thing Saturday morning. On a previous visit to the west end of the Soda Mountains I had scoped out some ridges of desert pavement and been wanting to come back ever since. With many square miles of huntable terrain I thought this would be a great place to start our hunting trip. We made one pit stop in Barstow at the Desert Discovery Center (which luckily had opened early) so we could all see the Old Woman meteorite. We were dismayed to learn that someone had actually broken into the center recently and stolen their donation box. This center does a lot of great outreach work and public education; I couldn't believe someone would steal from an organization like that. After a brief introduction to some meteorites I had brought for examination in the field and a quick lesson with my metal detector we began our hike into the hunt area. With temperatures in the low 90s and a nice breeze, it was a typical late-spring day in the desert. About a mile in I spotted my first ventifact of the day and called Fred and Doris over to have a look. This rock showed three predominant wind directions, with the wind that day coming right at the smallest face. The largest face is pointed north and represents the winter winds. To the south of this location we could see sand collected along the mountain sides; sand that was responsible for carving up this rock. My glove is in the picture for scale. This ventifact was a great sign of an older surface because it takes a long time for them to form, so I unslung the GB2 and handed it off to Fred. Fred was a natural with the machine and had no problem finding hot rocks, several were even buried 3-4" down. 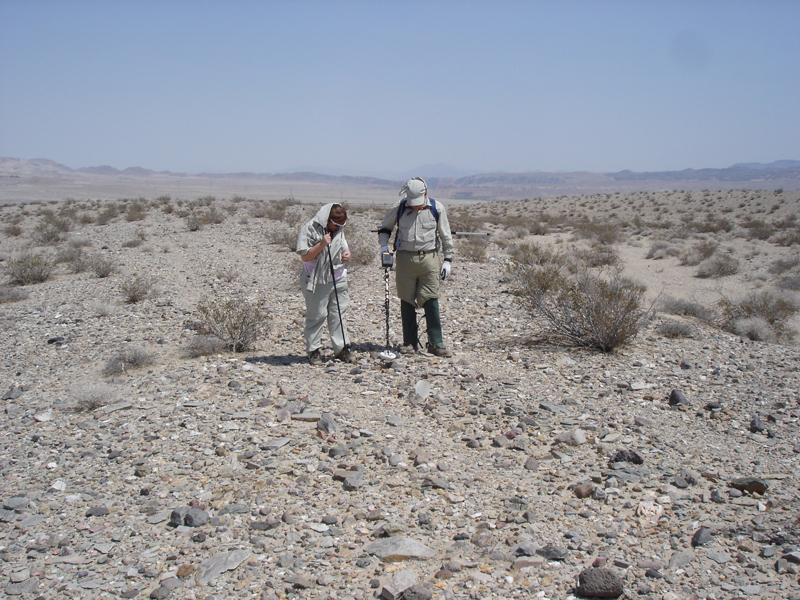 As I had noticed on my last trip, this was very detector-friendly terrain; there was no trash, no bullets or casings, very few hot rocks, and the GB2 stayed ground balanced all day no problem. Below, Fred narrows in on another hot rock while Doris stands ready with a magnet stick. I came across several cast iron fragments of some unknown contraption, one of which had writing stamped into it. I searched the immediate area and eventually found the other half with the rest of the writing. I'm not sure what it was, but it looked like it had exploded. Below, note the writing along the top and bottom edges. 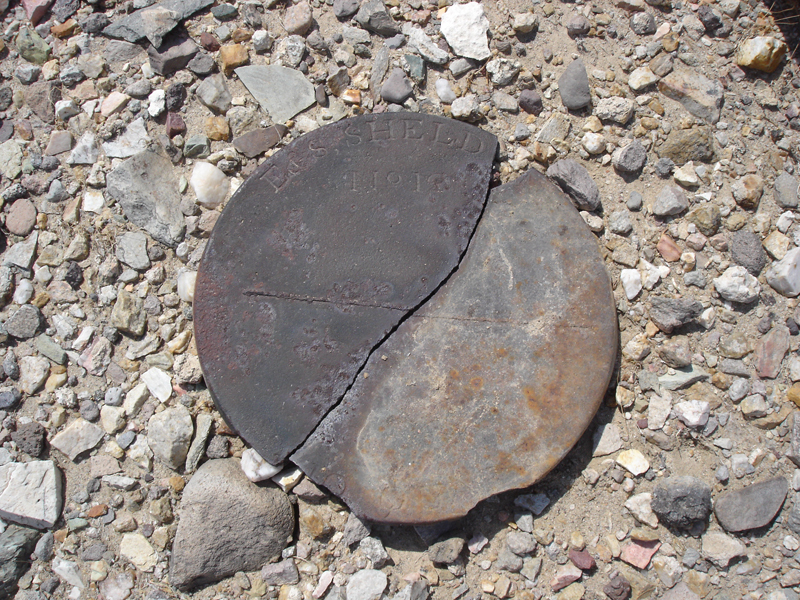 For scale, the item is about 12" in diameter. 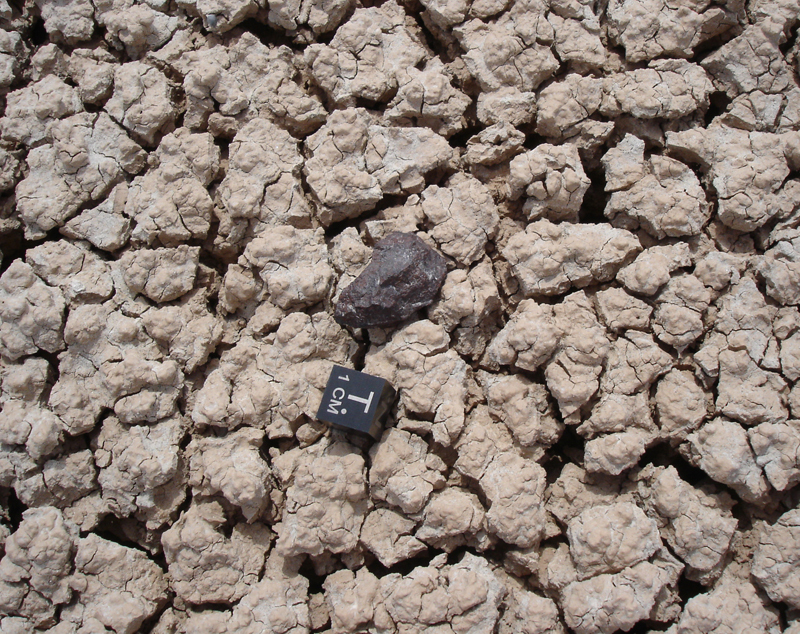 Below, Fred and Doris scour the desert pavement for meteorites. I hunted by eye, also. We guessed this water trough was all that remained of a failed cattle operation from earlier in the 20th century (date guesstimate based on the types of nails in the wood posts in the background). 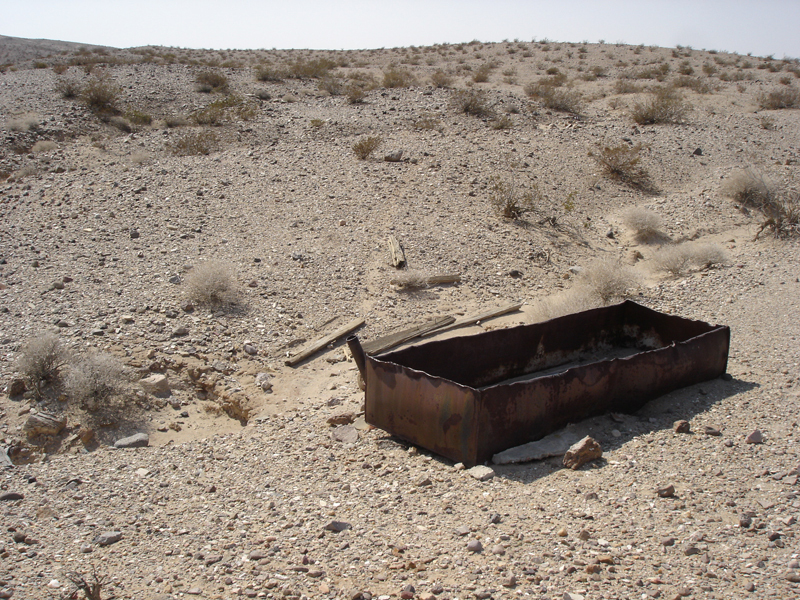 After a nice lunch in what little shade I was able to find under a creosote bush along the bank of a wash, we turned back to the truck without finding any meteorites. Day two would find us in Stewart Valley, so we had a couple hotel rooms waiting for us in Pahrump and a shower was starting to sound very appealing. We enjoyed a nice pizza dinner at the hotel, as well as a few well deserved cold brews. I had no idea, but there was a bluegrass festival in town that weekend, the Acoustic Grass Music Festival, and the bar was filled with musicians all just jamming away bluegrass classic after classic. I'll be damned if I don't love me some bluegrass! Everyone was invited to participate, and I sang along with the ones I knew the words to. What a treat, and a great way to wrap up the day. 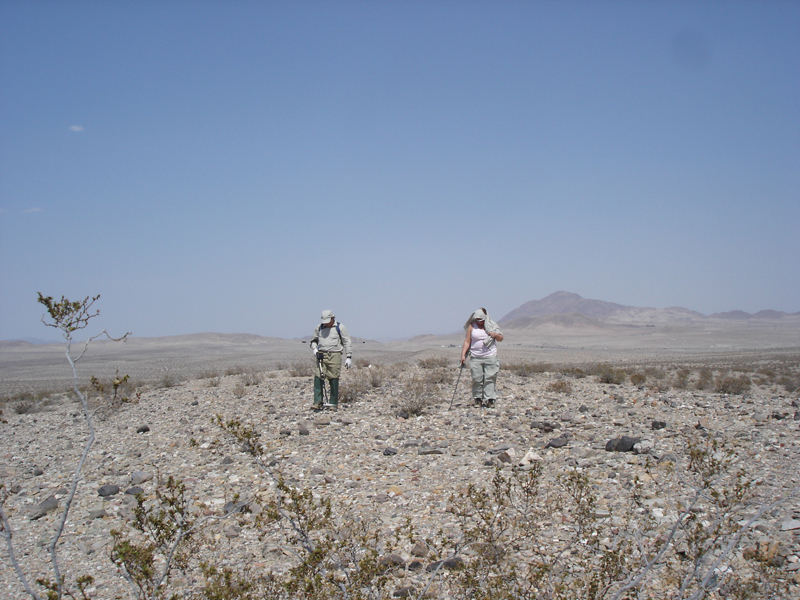 The next day we headed out to Stewart Valley to search the dry lake playa for meteorite fragments. The weather cooled off overnight, and we were greeted with low-70s and an overcast sky in the field. The wind up the valley from the south was pretty strong at times, making it tough to hear your own thoughts even, but we couldn't have asked for better temperatures or lighting conditions. 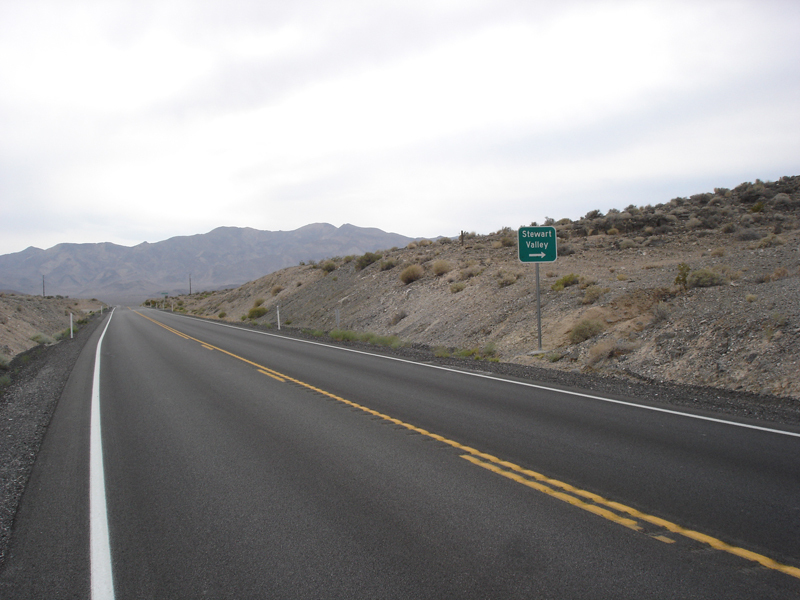 We parked on the Nevada side of the state line (because motorized vehicles are not permitted within the Wilderness Area on the California side) and started searching for meteorites. 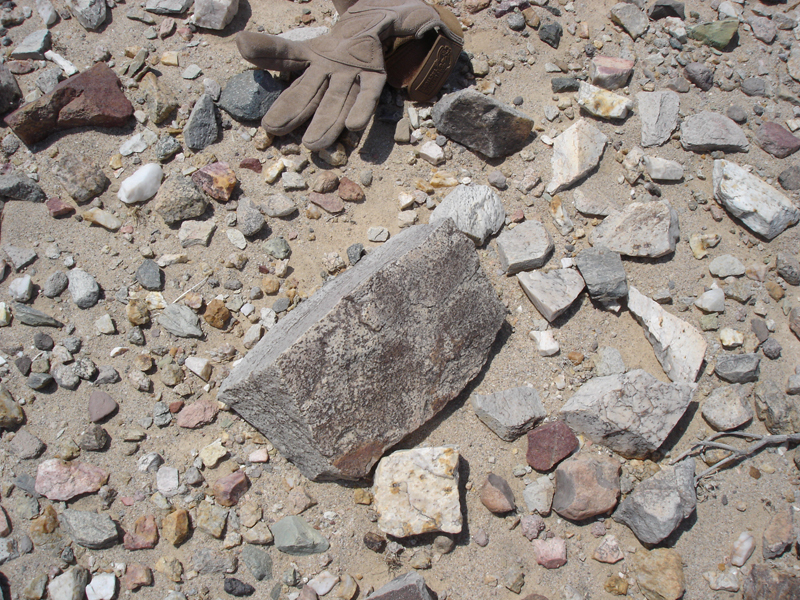 Not 0.25 miles from the truck I made the first find of the weekend, a 4.1g Cinco de Mayo fragment. I was hoping this would be a great sign for the rest of the day to come, but it turned out to be the only find. 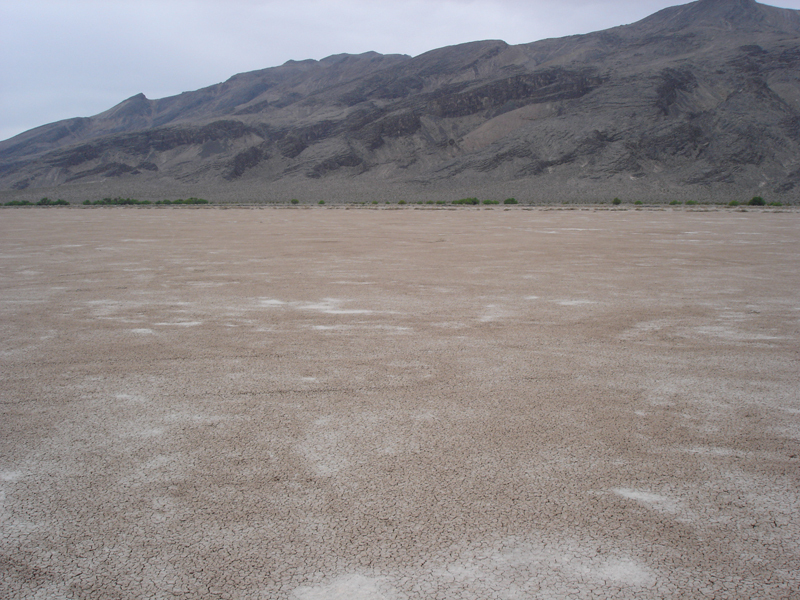 As you enter California on foot from the playa surface the land becomes a Wilderness Area. I was very disappointed at the number of vehicle tracks within the Wilderness Area boundary. I'd like to think that none of them were made by meteorite hunters, who all know that you cannot drive your truck/motorcycle/quad in a Wilderness Area. Unfortunately not all hobbyists are as respectful of nature as we are, and it is this type of reckless behavior that leads to the eventual closing off of large areas of public lands. To the west of the valley is the Resting Spring Range, and the tectonic forces that shaped them are clearly visible. 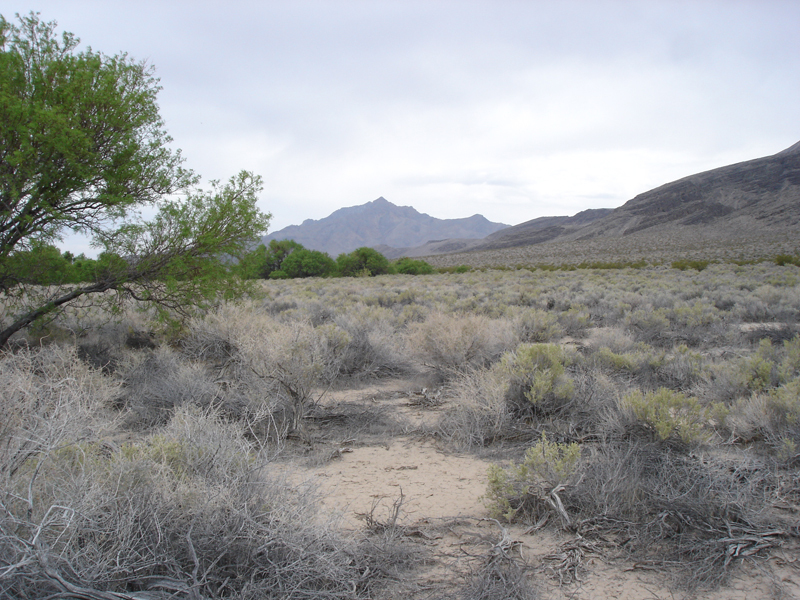 Pahrump Peak, the northern peak of the Nopah Range, is visible to the south of the valley. I was really hoping Fred and Doris would find something, too, but alas, the first lesson in meteorite hunting is that they are really, really hard to find, and no better way to learn that than by not finding any. I felt lucky to come away with the one I managed to walk over. It was a great weekend spent with great people; I can't wait to do it again.